Conservaatives need to take head-on the whole issue of a Hung Parliament. There's a growing sentiment - especially among some in the media - that somehow a Hung Parliament would give us the best result. The history of coalitions in our country is totally the reverse. Possibly the worst British Government in the 20th century was Lloyd George's coalition from 1919-22. Baldwin said it was full of men who looked as if they had done well out of the war. 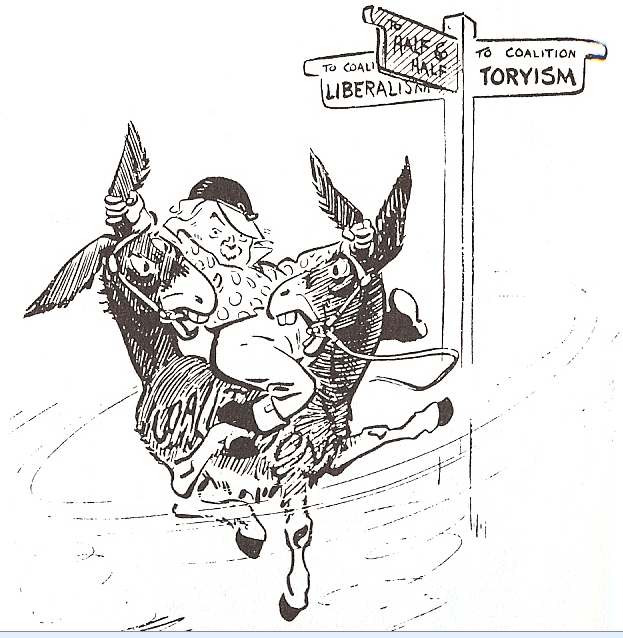 In 1922 David Low created a memorable image of Lloyd George, the Liberal PM, riding a two-headed donkey (see above). This says it all. All coalitions end in failure, the partners don't agree, postponement and indecision become the order of the day. Britain today does not need a two-headed donkey. 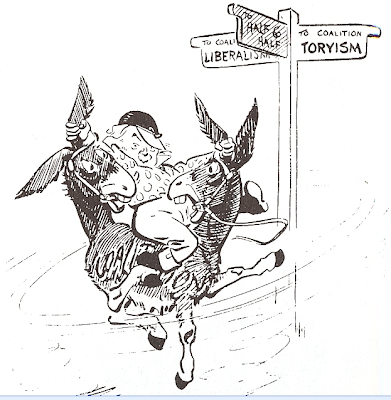 Michael Foot once said to a friend of mine that the first election he remembered was the 1922 election and how the two-headed donkey sunk the Liberals. History needs to repeat itself. "history needs to repeat itself." After this election I suspect that there will be an almighty outcry when people see the seats won vs. the number of votes for each party. Most people are turned off politics as over 80% of us live in totally safe Labour/Tory seats. Electoral reform will come next. Possibly some sort of PR. That will end Tory rule for ever. As the Guardian say today: "Get used to it". "All coalitions end in failure"
All governments ultimately end in failure - they don't last forever. In any event, would you call the World War Two coalition a failure? Or the many post-war coalition governments in continental Europe - not all of them good, but on balance delivering at least as well as UK governments over the same period. I think you totally lack historical and international perspective, Iain. You ought to be careful what you wish for. Polling shows that if people believe the Lib Dems can win, they will vote for us in unprecedented numbers (49%). And make no mistake: people are starting to believe that we can win. That would imply that you want to see a coalition government, which then fails spectacularly. I'm sure that's not what you mean. I'm afraid that the strategy of warning of the perils of coalition is doomed to failure. If the Tories can't persuade people to vote for them on their own merits, ahead of the Liberal Democrats, the prospect of a hung parliament isn't going to make any difference. The only voters it truly worries (and that includes me) are likely to be voting Conservative anyway. A far better strategy would be to start asking some hard questions about Liberal policies - the tax and spending proposals, for example, are completely incoherent. I've been saying for five years the danger (for consumers, retail and housing) is when you come out of the recession, not when you go into recession. Very bad figures. We are still waiting for the interest rate bounce you get when you come out of a recession (aka 1991). Hung Parliament will result in a shambles. The simple fact that this is being discussed after a disastrous 13 years of New Labour has surely got to tell you that Dave was the wrong choice? Surely a political animal such as yourself should know better then to be making such broad, sweeping statements and restricting oneself only to an inward looking comparison. It's not the liberals we need to kick into touch, it's the Labour party and their Union paymasters. This country prospered under centuries on tory/liberal administrations. Since Labour became "effective" after WW2 this country has slid downhill as The Comrades ahve destroyed it so they can build their utopia on the remains. It's Labour we need to destroy. Forever. Just heard a dangerous phrase on the Today program. No more Hung parliment, but a Balanced parliment. Who can be against that? Never mind the fact that this might be the last chance to change a government. Becuase lets face it, if Lab/libdems get their way we will have two party politic. The only difference is that instead of the ballot box deciding the outcome, the backroom will. John said: "Electoral reform will come next. Possibly some sort of PR." The Lib Dems want PR only because it would improve their standing, because their supporters are fragmented across the entire country. If they were still one of the two main parties, they'd want to keep FPTP for the same reason. Don't forget the 30 seats each for the BNP and UKIP and the Greens that PR would entail. FPTP has problems, but the reason it's used here and in the US is that it provides quick and decisive results from small changes in voting patterns, which means that (generally) the government is actually able to govern. I'm finding it hard to care about the supposed dangers of a hung parliament. What British politics of the 1920s is supposed to tell us about British politics today is entirely beyond me. Arguments against coalition government are all the more absurb because there are plenty of examples of where it works perfectly fine. Take Germany, the strongest economy in Europe, governed by perpetual coalition. Or Ireland, where a coalition government has taken the most decisive action of any country on earth to tackle its deficit, something most of our gutless politicians refuse to even discuss, let alone tackle. If a coalition doesn't work in the UK then it will be a failure of childish politicians putting their own interests in front of the country's. If, as seems likely, we're going to get a hung parliament then my advice to all concerned would be to grow the f**k up and get to work. Vote Blue Get Blue message successful ..... in driving down Conservative support from the low 40's to the low 30's . So Iain, you had to go back nearly 100 years to find a less than sterling example of coalition government in this country with which to illustrate your post. At the same time skipping past the coalition that saw us through the Second World War. I suspect this post is driven more by a fear of the Conservatives failing to gain an outright majority than anything else. Maybe it is the quality of UK politicians that make such coalitions end in failure? Oh Dear! How inward-looking is that Blog Iain? Coalitions are the norm in many European countries - and they work fine. A stong and able leader like Angela Merkel can work with social-democrats and/or with liberals. She has recently done so! Hmm. You don't think perhaps the Tories should embrace reality and accept that politics is more fragmented than it used to be? How to deal with that hung parliament when it happens? Say, we're not interested in working with other parties and let them to get on to do whatever they want? A Lib/Lab coalition will damage the LibDems - PR even more so, as the other minor parties also get a boost. If it's to be a referendum on voting reform, will it be held long enough after the downside of a coalition has become obvious - maybe turning people off reform? Will any form take the form of 'proper' PR as the LibDems would want it, or STV? "FPTP has problems, but the reason it's used here and in the US is that it provides quick and decisive results from small changes in voting patterns, which means that (generally) the government is actually able to govern." The problem is that it only really works in a de facto two-party system. If a third party makes a breakthrough it all goes to sh*t and you end up with all kinds of silly results like the party polling third in the popular vote winning the most seats. An electoral system that can't handle more the two parties isn't really much of a system at all. @Tom King. Libdem supporter? Unless the strong holds of Tories and Labour are wiped out, Libdems would not gain absolute majority. This has as much chance as me succeeding Sir Alex as manager for Man United. It is Brown the PM again with Clegg and Cable in his ministry. Clegg and Cable are for power, wait until they are driven by official car and have perks like their buddies had in Scotland. It is Brown all the way. If Labour finishes third in the popular vote but remains the largest party in terms of seats and then forms a government with the LibDems who finish second in the popular vote, leaving the Tories who won the popular vote out of office altogether, would the Tories then support electoral reform? Or would they maintain their principled (snigger) stand that FPTP is best for the country. In the event of a hung parliament where Labour has the most seats but the Tories have the most votes, it is quite possible that Clegg would form a coalition with Dave if Dave agreed to back electoral reform. If Dave doesn't offer that, his political career is over and given that we know he will do and say anything to achieve his vainglorious ambition to be PM, I think he will. @Paddy Briggs. Coalition is norm in Israel. See where it has led to them. Coalition govt was in Scotland and Labour dictated the agenda while the Libdems enjoyed the trappings of power. In Germany nothing happened in the CDU-SPD coalition and Merkel won a massive mandate now and the junior partners have no power. Italy? I do not say more. It is Brown and Clegg for 20 more years as they keep on coming and destroy the country flooding with immigrants who gain amnesties many times over and taking the country to the Euro and then the Greek targedy. What do we expect with voters who behave like they did in Diana's death? I think your proposed line of attack against a hung parliament is way too sophisticated for the average non-anorak voter who really isn't up to assessing the record of Lloyd George's 1919-22 government. Most voters, I suspect, are prepared to buy the argument that a hung parliament, with all its connotations of balance, collaboration and reason, could be a good thing. If I were Cameron the only thing I'd be saying, over and over, is "Vote Clegg, get Brown". The Tories really need to nail down the idea that a hung parliament would mean a continuation of the discredited and despised Labour administration. At the same time Cameron should put Clegg on the spot to promise ahead of the poll that he wouldn't prop up Gordon Brown in power if Labour came second or still less third in the number of votes cast. When Clegg was asked the votes or seats question at the Lib Dem manifesto launch, his inability to answer was woeful;yet a party committed to PR cannot plausibly answer other than that it should be the number of votes that matter in deciding who has won or who has lost. The media has a mission - to stop Cameron. Until he declared a determination to hold referenda on further transfers of power to the EU, and to repatriate powers, he was cruising to victory. Then they quietly pulled the media rug. Now they're launching Clegg to stop him, as they realise Brown's cooked. The public cannot read the entrails. But instinct and common sense could well see a reversal in the current media frenzy, as the propaganda tires. It's at the high water mark that you find the ludicrous claims such as 'we will get 49% if people think we can win' coming from Lib Dems, as in comments above. The next two weeks will see a gradual reversal, with Conservatives back at 35, Lib Dem and Labour on 25/26 apiece. This Country needs a Hung Parliament like a hole in the head! The economic reality is that Britain’s AAA credit rating has been placed on probation until the outcome of the General Election. The next Government of whatever hue will be forced to act swiftly to avoid a downgrading of our AAA credit rating, the consequences of which would be catastrophic for everyone. Any downgrade would lead to a run on the pound. Increased interest rates would follow in quick succession resulting in escalating mortgage rates. The loss of confidence in the economy and commerce in general caused by such events would quickly translate into to job losses on a grand scale. A hung Parliament led by a weak Government unable to take the decisive decisions needed, would be the surest way to trigger such events! We only have to look at what is happening to the Greek economy at present, with two credit downgrades in quick succession, for a glimpse of the rapid deterioration that could very easily come about in Britain. Don’t believe me? Just watch what happens to the stock markets nearer to 6th May, if the likelihood of a hung Parliament continues. There is clearly an ill-considered, self indulgent, anti-politics suicidal frenzy going on in the Country at the moment. It is vitally important for people to stop and consider the huge price that each of us would have to pay financially, if the above scenario came about due to a hung parliament. The very real prospect of Gordon Brown winning the most seats with the least votes and being allowed to continue as Prime Minister by some back room, cobbled together LibDem/Labour pact, would deliver a fatal blow to democracy in Britain. The financial price each of us would have to pay would pale into insignificance, in the face of this terrible loss to our democratic freedoms. Our precious democratic rights and freedoms are too valuable to be discarded, merely to deliver a slap on the wrist of unworthy politicians, most of whom are standing down at this election. A dangerous game to play.After Labour's whopping majorities and Thatcher's landslides the public WANT a hung parliament.By pushing the danger of a hung parliament, from a position of weakness, you are simply encouraging people to vote accordingly.The Tory campaign is a mess. And the Lib-Lab pact? Have you forgotten that? If a voting system was devised that kept the Conservative Party permanently in power nearly every Conservative Party member would vote against it. That a Liberal Democrat Party member would stuggle to even comprehend why anybody would do such a thing tells you all you need to know about their commitment to the pluralism of a free society - notwithstanding the fact that they apply the descriptions Liberal and Democrat to themselves. A Liberal Democract is essentially a middle class Socialist - a sandal stamping on your face for ever. Listen to Sarah Teather for a few moments. Do you think she is a sanctimonious know it all who knows next to nothing about anything except the demands of her own ego, or do you think here is an individual who comprehends that the world has a diversity of people in it with a variety of ways of understanding the world and so it is important to radically limit the power of the State (and the self-serving bureacrats - including politicians- that thrive within it) if you believe in something called a free society. In my opinion she only has one tone, one message, one belief - give me power because I know better than you how should think and behave. Dan Brusca said: "The problem is that it only really works in a de facto two-party system." Which is one more scenario than PR works in. The simple fact is that in a three-party system, or anything more complex than that, nobody achieves a majority and therefore there is no popular mandate for anything. Parliaments become nothing more than glorified committees who struggle to agree even the most trivial actions. The best outcome for this election is a two-party system, Tory and Liberal, with the centrist remnants of Labour taking the whip of one or other. Two parties is the only way to get a stable (rather than stagnant) political system. The fact that polls show that most Liberal Democrat Party members would rather prop up Brown (and the most illiberal Labour government in a generation) than Cameron (the most liberal Conservative leader in a generation) implies that Liberal Democrats are very immature and motivated by little more than hatred of the "Tories" i.e. they are (because unlike the Conservatives they self-identify as middle class?) a more smug and patronising version of the Labour Party. That Nick Clegg sees himself as leading the fight against the establishment has got to be the biggest joke of the campaign. "All coalitions end in failure,"
Yes, if only Chamberlain and the tories had been left to get on with it on their own. All goverments end in failure; coalitions just the same. We have nothing to fear from a Hung Parliament. If the three parties poll almost the same percentages of the vote and the no. of seats differs by more than a factor of three (both highly likely) the First Past the Post system will finally be exposed for the complete sham that it is. Let's get rid of it. The sooner the better. You don't think the UK has changed a little since the 1920's? The conservatives can't blindly keep pushing the "hung parliament" won't work line to scare people, if they aren't willing to say why it is it's impossible in the UK but operates successfully in so many countries across Europe. Perhaps are politicians simply aren't as mature. The outgoing majority Labour Government is hardly a terrific advert for one party rule, is it? Truth is it depends on who you're talking about and why parties are together and what their policies are. Suez happened under one party rule, WW2 victory under a coalition. I am afraid your theory has got more holes in it than a colander. Boo makes a good point. Also a set of weighing scales with both pans empty is balanced. But there's nothing there. Dave knows what to do to get more votes (or my vote, anyway), and he won't do it; and he won't do it because he doesn't want to. Saying we should vote Tory to avoid a hung parliament is a kind of blackmail; Dave has no moral right to our votes. I suspect most of the support for the LibDims comes from people who do not support windmillery & joining the Euro but do support getting a just & democratic electoral system – this must include a lot of UKIP & indeed BNP supporters – remember that at the Euro election more people voted for PR supporting parties than for Tories & Labour combined. If that election means anything then an election which produced proportional results would see the LibDems fall to 4th place & the Conservative & UKIP partiies of the “right” gain an overwhelming majority. The Conservatives should now acknowledge both the justice & inevitability of a proportional system & put their efforts towards the top up system (which would end the advantage Labour get from having less populous constituencies & is favoured by UKIP & most LibDems) & for another immediate election as soon as this reform is in place. Not only is the FPTP electoral system wholly discredited by this poll but it is clear the Conservatives cannot, under any circumstances credible within a generation, win under it. But sane, pro-market, eurosceptics unconvinced of the need to destroy the economy for eco-fascism, are almost guaranteed to win under a PR system & for the first time a democratic electoral system is in the interests of most Tory MPs. Peter has said he wants a single new party under the FPTP system but there has been no clear way it could happen. However a multi-party PR election resulting in an alliance hovernment of Conservatives & UKIP within a couple of years is now easily possible. So how long can senior Tories continue saying that the current system is just & democratic & they like the results. Every day they conitinue they simply marginalise themselves. Of all the nonsense put out by the Tories, this is among the worst. Austria, Belgium, Denmark, Finland, Germany, Switzerland and - yes - Scotland figure among the many countries with systems of proportional representation. On the whole, I believe they are better governed than the UK. Our system is fundamentally undemocratic - beloved of the traditional parties because, once they are in power, it provides them with an unfettered licence to do more or less as they wish regardless of the views of people or their own electoral promises. It is one of the main reasons why so many UK citizens complain of feeling powerless and ignored by the political class. David Cameron- I suspect unwittingly - makes a similar complaint when he proclaims with histrionic alarm: "Vote Nick Clegg and you get Gordon Brown". Should that happen, he can blame the unfair voting system which he and his colleagues are so grimly determined not to change. "The outgoing majority Labour Government is hardly a terrific advert for one party rule, is it?" If you want to get rid of the Labour government and have a political change you know what to do. HINT - It does not involve voting Liberal Democrat. "feeling powerless and ignored by the political class"
If you think that now, when at least there is a chance of changing the government, just wait until you have a voting system that keeps the same politicians in charge, permanently. Oh but wait, they are the politicians you want to have in power permanently so it is ok.
"feeling powerless and ignored by the political class." What a total fraud you are "Jeremy". Politics for you is simply a way of imposing your opinions on everybody else, the exact opposite in short of liberalism.